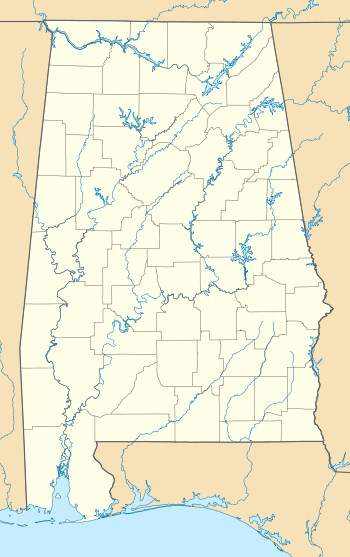 The Holt Street Baptist Church is an abandoned Baptist church in Montgomery, Alabama, United States. The church served as a meeting place for Montgomery's black community during the Montgomery Bus Boycott. 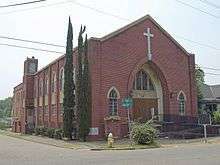 In 1998, the church closed and relocated to a new location in Montgomery. The Holt Street Baptist Church was established in 1909. The church building, located at the corner of Holt Street and Bullock Street, was completed in 1913. The first reverend was I.S. Fountain. On Thursday, December 1, 1955, Rosa Parks was arrested after refusing to give up her seat on a Montgomery bus to a white passenger. In response, the Women's Political Council, an African-American civil rights organization founded in Montgomery, organized a boycott of the city's buses by members of the black community. By the time I arrived at the meeting, the church was so filled up that a crowd of hundreds spilled out into the street, and speakers had to be set up outside to accommodate everyone. The excitement around the church was electrifying, and I remember having a sense that something powerful was being born. I squeezed my way through the crowd to my seat on the platform, where a lively discussion about the boycott strategy was underway. The meeting at the Holt Street Baptist Church began the year-long Montgomery Bus Boycott. A court case, Browder v. Gayle, was launched claiming that bus segregation was unconstitutional under the Fourteenth Amendment. On November 14, 1956, while the boycott continued, the Supreme Court ordered the state of Alabama to desegregate its buses. That evening, mass meetings were organized at both the Hutchinson Street Baptist Church and the Holt Street Baptist Church. King spoke at both meetings, where 8,000 attendees voted unanimously to end the boycott when the Supreme Court decision took effect. On December 3, 1956, King attended the Holt Street Baptist Church where he delivered a speech entitled "Facing the Challenge of the New Age". It was the opening address of a week-long "Institute of Non-Violence and Social Change", organized by the Montgomery Improvement Association. In 1998, the church moved to a new complex called "The Village", located on South Court Street in Montgomery. Wikimedia Commons has media related to Holt Street Baptist Church. 1 2 3 "Our History". Holt Street Memorial Baptist Church. Retrieved August 23, 2016. 1 2 Phibbs, Cheryl Fisher (2009). The Montgomery Bus Boycott: A History and Reference Guide. ABC-CLIO. pp. 13, 15, 16, 19. 1 2 3 Clayborne, Carson (1992). The Papers of Martin Luther King, Jr: Rediscovering Precious Values, July 1951 - November 1955. University of California Press. pp. 5, 52, 424. ↑ Parks, Rosa (2001). Carson, Clayborne; Shepard, Kris, eds. Address to the First Montgomery Improvement Association (MIA) Mass Meeting. A Call to Conscience: The Landmark Speeches of Dr. Martin Luther King, Jr. Grand Central Publishing.